If you had asked me about the topic yesterday, I'd have said that tech has already hit "peak blockchain," but based on today's developments, I'm reassessing my views. Sirin Labs revealed its specs for the "first blockchain smartphone" earlier this year, and in a surprising twist, the specs for the Finney were actually realistic. 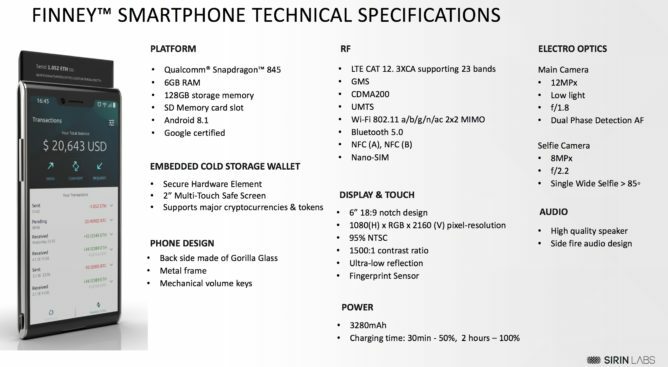 Now the company has some visuals which show the industrial design for the phone, including a secondary "Safe Screen" running standalone firmware for enhanced wallet security. This secondary screen "will be able to independently verify that Finney wallet transactions are being sent to the correct addresses, allowing users to verify they’re not being tricked by malware or hackers to send their cryptocurrencies or tokens to a fraudulent third party." So presumably one of Sirin's apps is able to pass transactions to this system for greater security. We also knew the Finney was going to run Sirin OS—the company's "ultra-secure" fork for Android—and now some of its new features have been revealed. It will include a cold-storage wallet, token conversion service, multi-blockchain Dapp (decentralized app) store, and "a comprehensive and multi-layer cybersecurity suite," whatever that means. The token conversions are one of the more interesting bits, as Sirin claims it will work with purchases. Let's just hope the conversion rate isn't set to favor Sirin too much when it comes to fees. Sirin has selected Foxconn to make the handset, and other industrial design features include 3D Gorilla glass on the front and back; a concave metal frame; notched display; and a "Shield Element" housing the camera, sensors, and fingerprint scanner. Most other specs remain unchanged, though the battery is getting a slight bump in capacity to 3,280mAh. SIRIN LABS Unveils the Design for the Dual-Screen FINNEY™, Introducing “Safe Screen” for the First Blockchain Smartphone. SCHAFFHAUSEN, Switzerland--(BUSINESS WIRE)--SIRIN LABS (https://sirinlabs.com/) the company that ended 2017 with the fourth largest crowdsale in history by raising $157.8M, is unveiling the final design of the FINNEY™, the first ever blockchain smartphone. The uniquely designed FINNEY™, due to hit markets this November, contains a “Safe Screen” — a standalone screen that functions on dedicated firmware and will be able to independently verify that FINNEY™ wallet transactions are being sent to the correct addresses, allowing users to verify they’re not being tricked by malware or hackers to send their cryptocurrencies or tokens to a fraudulent third party. An embedded cold storage wallet. A comprehensive and multi-layer cybersecurity suite. A Token Conversion Service (TCS). FINNEY™ users will be able to activate the embedded cold storage wallet by sliding-up the “Safe Screen.” Combined with the multi-layered SIRIN OS™ security suite and Token Conversion Service, the FINNEY™ will enable safe, secure, and seamless automatic token conversions for various purposes, including purchases for decentralized applications within the SIRIN LABS DApp store. These conversions can be completed without the unnecessary inconvenience of obtaining tokens through an exchange; thus simplifying the complicated user experience. FIH Mobile (Foxconn International Holdings) has been chosen to manufacture the phone, while SIRIN LABS is leading the development of the cold storage wallet and of SIRIN OS™. Sleek and expressive design articulating the vision of the SIRIN LABS aesthetic. 3D Gorilla Glass on both the front and back of the device. Matte back cover 3D glass. High gloss, concave metal frame. Thin bezel and notch display. Metallic signature Shield Element accommodating the camera, sensors, and fingerprint scanner. Secured touch “Safe Screen” for the built-in cold storage wallet to protect against malicious attacks. The unique sliding design “warms” (activates) the cold storage wallet, which readies it for use when opened. User experience designed to cater to the needs of crypto experts and novices alike. SIRIN LABS is developing the FINNEY™ — the premier open source, ultra-secure blockchain smartphone with an embedded cold storage crypto wallet. Our vision is to bridge the gap between the blockchain economy and the mass market by solving the two greatest barriers to the crypto market: security and user experience. After concluding 2017 with the 4th largest ICO in history, SIRIN LABS has already established strategic partnerships with industry leaders like Cardano and FIH (Foxconn International Holdings- makers of the iPhone, Xbox and Kindle), and has signed on the football superstar, FC Barcelona’s Leo Messi, as its official global Brand Ambassador. FINNEY™ will run on SIRIN OS™, an ultra- secure and Google-certified “fork” of Android. Follow us on Telegram: https://t.me/sirinlabs.